As summer vacation and swimsuit season rolls near, healthy eating is on the mind. 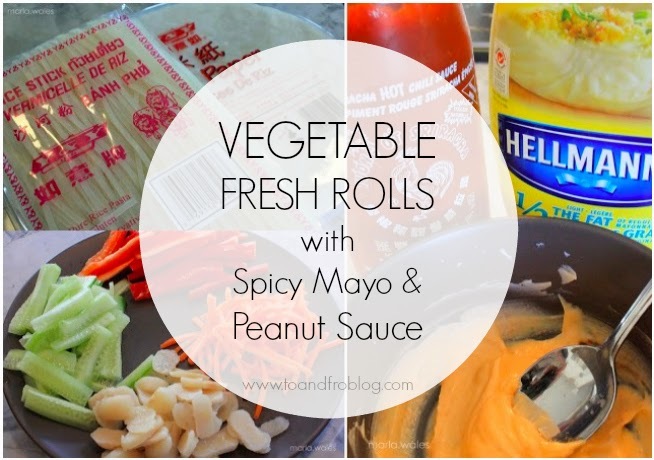 Lately these vegetable fresh rolls have been a staple in our house. They are a much healthier choice than their deep-fried counterparts, and the peanut dipping sauce kicks them up a notch. They may be a bit time consuming to make, but sure are worth it in the end! In a small bowl, combine 1/4 cup mayo and desired amount of sriracha hot sauce. If you like heat, add more hot sauce. Bring a medium saucepan of water to boil. Boil rice vermicelli 3 to 5 minutes, or until al dente, and drain. Allow to cool. Fill a pie dish with warm water. Soak the rice papers for no more than 10 seconds. Make sure you don't soak them too long, remember they will continue to soften as you work with them! Remove softened rice paper from water and place on hard surface, such as a clean and dry countertop or cutting board. Place a little spicy mayo in the middle of the wrapper, followed by the rice noodles and your fillings of choice. Once you have added all of your fillings, roll the paper. Start with the end closest to you. Roll tightly around veggies. Fold each end over and then continue rolling. Lay completed roll on plate, cover with moist paper towel and refrigerate until ready to serve. Complete above steps until you run out of ingredients. In a small bowl, add peanut butter, vinegar, lime juice, oil, soy sauce, honey and sugar. Whisk in hot water. Add minced garlic and red pepper flakes and combine. Side note, this peanut dipping sauce also makes a great salad dressing. Is this a recipe you'd make? 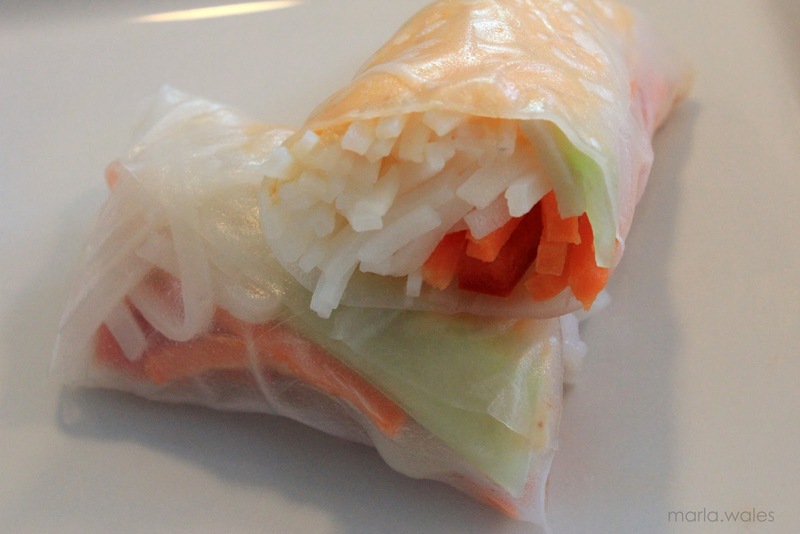 Just pinned this as the other day my husband and I were talking about our craving for spring rolls. You're right, the "fresh" ones like these are such a great alternative to fried spring rolls. 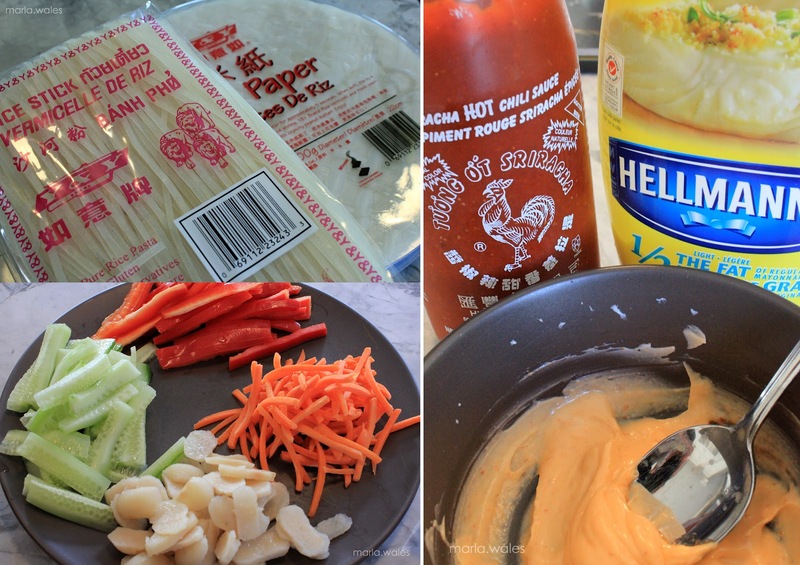 Thanks for sharing this recipe - that peanut sauce looks so yummy! Yum I LOVE Vietnamese spring rolls! They're so delicious!